9 cm/3 1/2"is this cute early Parian dollhouse boy with brown hair with brush strokes at the temples.Lovely painted detailed face, fine molded hair with well defined curls and brush strokes.Wonderful lustre painted and decorated boots.Cloth body parian limps Dressed in his originaltwo pieces tiny striped outfit, with a belt-all antique! He is a lovely doll. Ca 1860.Fine condition all over. 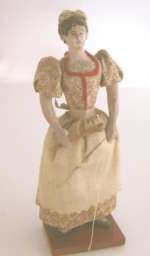 5"/ 13 cm.Rare early Wax/wooden doll house doll lady.. Wax over Papier mache/paper machee with wooden hands.Fine detailed facial feateaures.Molded hair. 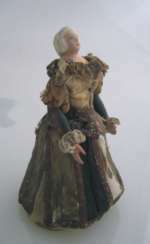 Lovely original silk decorated dress-very fragile.Under her dress, she has a wooden single wheel mechanisms, that lets her move.Fine condition , some wear to her dress A very special doll. Would be lovely in an early dollhouse or in a doll collection of early dolls! A pair of beautiful blown glass Candlesticks. 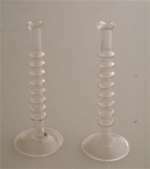 A pair of beautiful blown glass Candlesticks in a wonderful"turned" design. 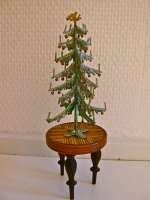 Great to display on a dining table in a larger scale dolls´house. Fine condition all over. Germany ca 1880. No cracks.Perfeckt for the candlelight dinner.Murano. Rare early Glass Carafe with goldecor. 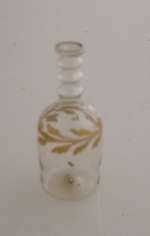 1 3/4" 4,75 cm.This is a Rare early Glass Carafe with gold decor.A ring of fine detailed painted leaves makes this fine decanter so very special. Probably French or Italien mid. 19. century.. The condition is excellent! All bisque doll with molded hair and bathing suit. 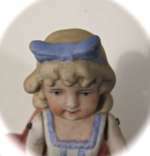 13 cm is this cute all-bisque doll with nicly molded hair, blue bow and molded bathing suit.. Germany ca 1910. Fine painted facial features.Closed mouth, fine painted eyes, deep molded hair A lovely doll to a good price!no cracks or chips. 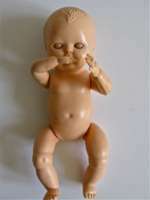 Vintage Rosebud baby doll from the 50-ties. 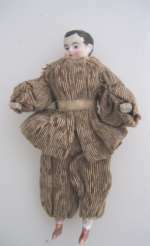 Lovely nostalgic Rosebus doll from the fifties. She is 18 cm long. Fine condition all over. I have original dress to fit her as a girl or a boy (included in price. Ein schöner und seltener antiker Weihnachtsbaum aus Zinn für die alte Puppenstube. Dieser kleine Weihnachtsbaum aus Metall hat schön dekorierte Zweige mit Kerzen und Christbaumschmuck. An der Baum-Spitze ist ein goldener Engel, der Trompete spielt. Höhe: 12 cm.